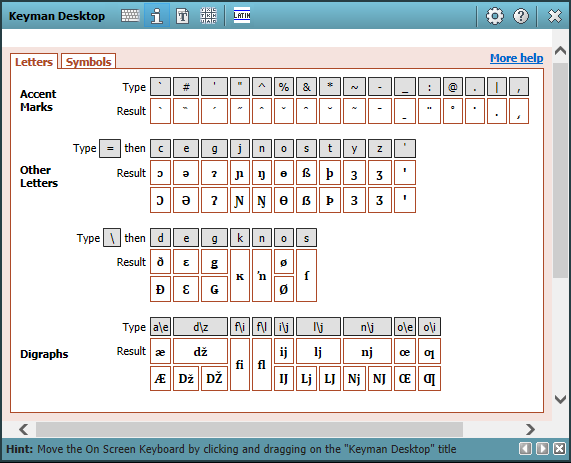 The Keyboard Usage tool of the Keyman Toolbox shows helpful hints on how to use the currently selected Keyman Desktop keyboard. From the Keyman Desktop menu, select Keyboard Usage. Some keyboards include dynamic help in Keyboard Usage. This help allows you to click on a letter to insert it into your document directly. Some keyboards include static help in Keyboard Usage. This help will give you important information about the keyboard. Some keyboards include links to help documentation in Keyboard Usage. Click Keyboard Help to find the help document for the keyboard. Some keyboards include links to the On Screen Keyboard tool in Keyboard Usage. This means that the keyboard has an On Screen Keyboard view. Some keyboards do not include Keyboard Usage. You may find help for these keyboards by looking in the Windows Start menu, under the name of the keyboard.